That still isn’t our best team. John Lewis III hasn’t run with the 4x100 team yet and he’s been a mainstay if that squad the last couple of years. LSU was running their top guys. But, this was good for the Coogs. Helps wake them up a bit and gives them some early motivation. Amere Lattin claimed the invitational 400-meter hurdles title to highlight Houston Track & Field action at day three of the Texas Relays on Friday. Lattin came on top in the 400 hurdles invitational with a time of 49.80 to improve his nation’s top time and solidify his No. 1 spot in The American Athletic Conference. The men’s 4x100-relay of John Lewis III, Mario Burke, Brandon Taylor and Travis Collins finished third in qualifying with a time of 39.60 to advance to the finals. On the women’s side, Birexus Hawkins finished second in the 400-meter hurdles with a time of 58.04, jumping to the No. 1 spot in The American and moving up to No. 8 in the NCAA. Quivell Jordan placed second in the open 400-meter hurdles, setting a PR of 50.25 to improve his No. 2 rank in The American. Lattin placed on top in the 110-meter hurdles qualifying out of 70 athletes, setting a PR of 13.57 to improve his No. 1 rank in The American while jumping to the No. 4 spot in the NCAA and tying the fifth-fastest time in UH history. Taylor also qualified for the finals of the 100-meter dash with a wind-aided time of 10.26. Triston Gibbons set a PR in shot put with a throw of 58-1 (17.70m) to improve his No. 2 mark in The American. The men’s 4x200-relay of Nicholas Alexander, Mario Burke, Kahmari Montgomery and Obi Igbokwe finished on top with a time of 1:20.94, breaking the Houston program record and clocking the No. 30 time in world history. One day after winning the invitational 400-meter hurdles, Lattin ran to first place in the 110-meter hurdles with a time of 13.40. The men’s 4x100-meter relay of Alexander, Burke, Brandon Taylor and Travis Collins finished second with a time of 38.45 to jump to the No. 2 spot in the nation, improve their No. 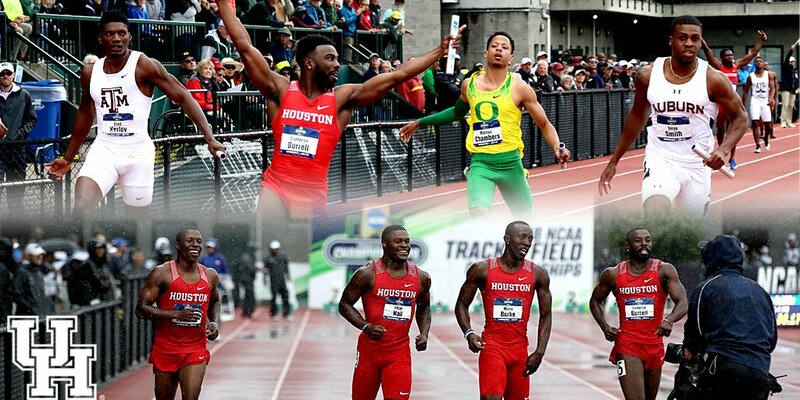 1 time in The American Athletic Conference and become the fourth-fastest relay in UH history. The men’s 4x400-relay of Jermaine Holt, Igbokwe, Trumaine Jefferson and Quivell Jordan placed second with a time of 3:07.37 to jump to the No. 2 spot in the nation. The women’s 4x200-relay of Birexus Hawkins, Payge Side, Essance Sample and Ashley Seymour finished second with a time of 1:34.58. Taylor also finished third in the 100-meter dash with a wind-aided time of 10.18 to move up to No. 6 in the nation. Felipe Valencia extended his shot put lead in The American by over a foot with a top throw of 59-11.25 (18.27). I was there. Bad look by LSU but stuff of rivalries. I’m OK with it, except for the bump. I like to see emotion from these competitors. Although, I hope when we beat them later on, we don’t even acknowledge them afterwards. Coach Lewis actually appeared to like the interaction. Fired his guys up. Truth is, he is for anything that brings more attention and press to T&F. Consistent theme in his tweeter feed. What?!? Are we sneaking Burrell back in for the NCAA’s? Cut his beard off, dye his hair, it could work.